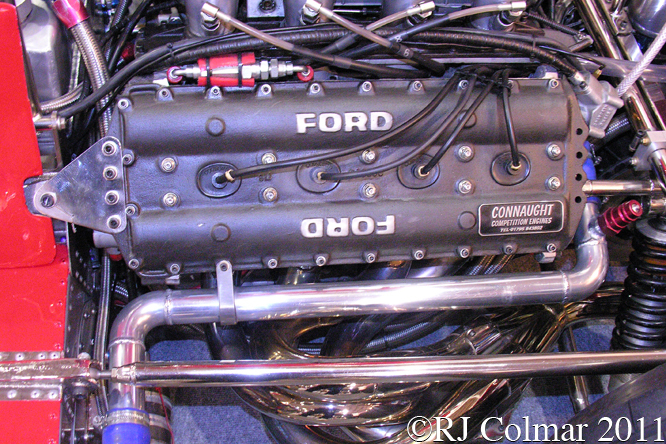 For the 1975 US Formula 5000 season Don Nichols had Tony Southgate design a F5000 version of Shadow’s primary Formula one contender the DN5, known as the DN6 the main differences were that it required a sub frame to carry the 5 litre / 302 cui Chevrolet engines the team ran up until Atlanta, in place of the load bearing Ford Cosworth DFV used to power the DN5. 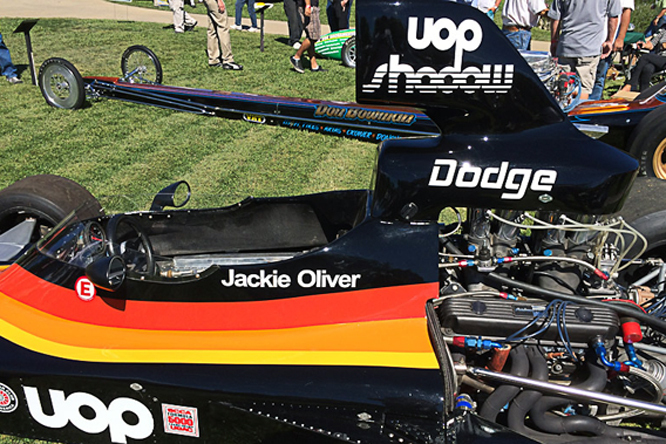 1974 Can Am Champion Jackie Oliver was retained to drive the UOP Lead Free Oil Products F5000 Shadow DN6 and his results, 3rd at Pocono, 6th at Mosport, 11th with a blown engine at Watkins Glen, 2nd At Road America and 4th at Mid Ohio showed the Chevrolet powered car was not lacking too much in competitiveness. 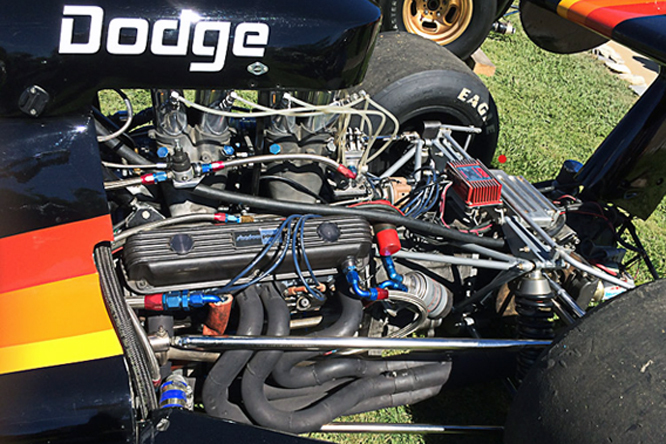 At Road Atlanta the team switched to Dodge Motors, coincidentally or otherwise just as the Shadow Formula One team was seeking an edge with the Chrysler Europe Matra V12 powered Shadow DN7 in Austria and Italy. Just as with the Matra V12 in Europe the Dodge motor did not significantly improve Jackie’s fortunes he finished 4th in Atlanta, crashed at Long Beach, came home fifth at Laguna Seca and retired with low oil pressure at Riverside. 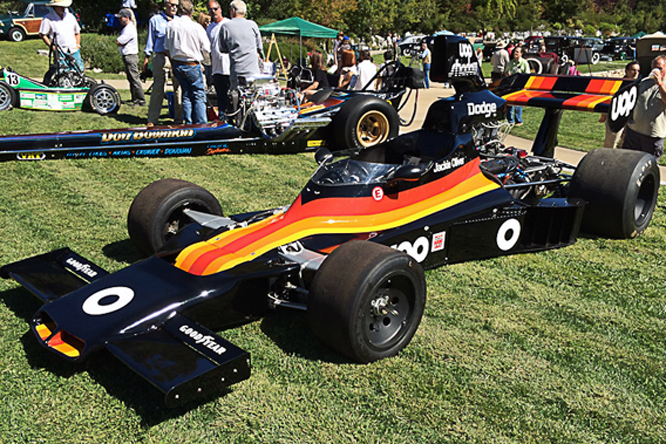 For the Long Beach Grand Prix the team entered their rising Formula One star Tom Pryce in a Dodge powered DN6 which is believed to be the one seen in these photographs taken by Geoffrey Horton at Ironside Concours d’Elegance a few years ago. Tom retired from the race after completing just 14 laps of the final with a broken gearbox after qualifying 5th one spot behind Jackie and finishing third in his heat. At Riverside the team invited rising Tyrrell star Jody Scheckter to try the guest DN6. 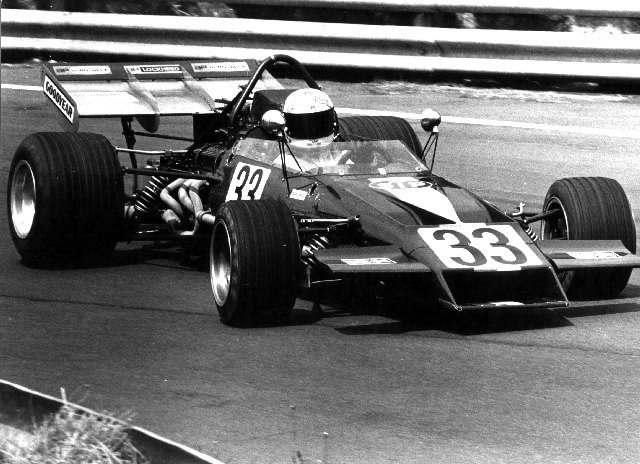 The South African qualified 3rd, 5 spots ahead of Jackie, finished his heat with a blown head gasket after 5 laps and retired from the race after 33 laps with an engine problem, Jackie carried on racing the Dodge powered DN6 in 1976 with considerably more success when the car remained reliable. 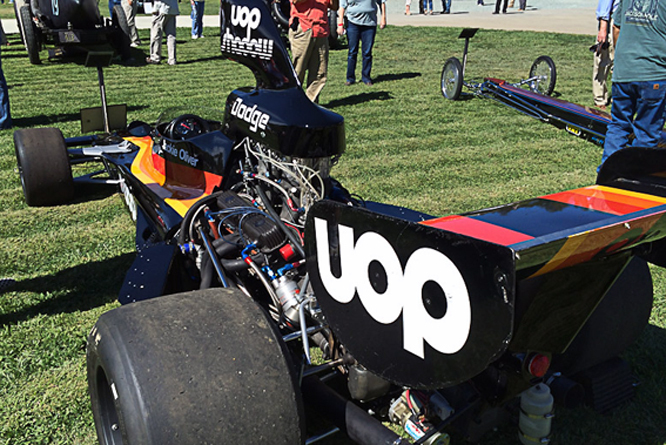 My thanks to Geoffrey Horton for sharing his photographs of the DN6, which has been restored by his neighbor Dennis Loscher, taken at Ironside Concours d’Elegance in 2013. Thanks for joining me on this “Dodge Powered Guest Car” edition of “Gettin’ a li’l psycho on tyres” I hope you will join me again fr a look at the last of the nine Mercedes Benz 300 SLR’s to be built. Don’t forget to come back now ! 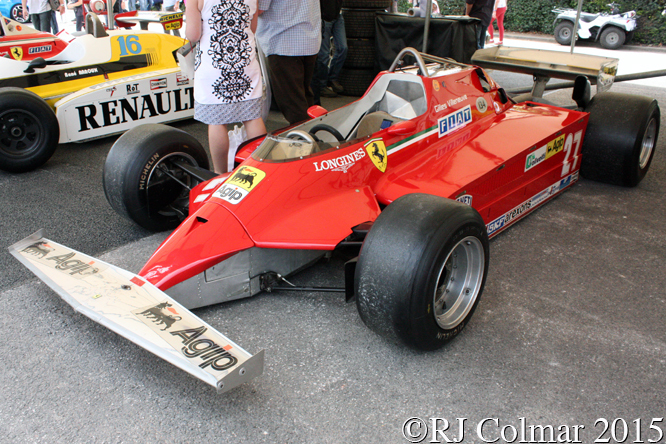 This entry was posted in Uncategorized and tagged Chevrolet, Colmar, Concours, d'Elegance, DN6, Dodge, Geoffrey, Horton, Ironside, Nichols, Oliver, Pryce, Psychoontyres, Ralph, Scheckter, Shadow, Southgate on October 25, 2015 by Ralph. 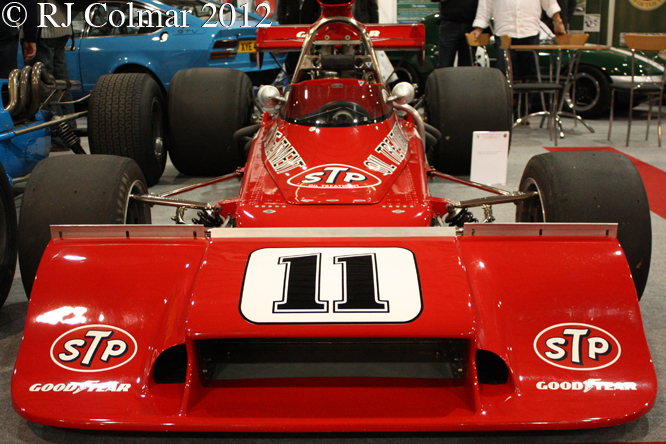 This month’s Saturday posts will feature 4 Formula 5000 cars built for the 1973 season. Formula 5000 was an open wheel Formula for vehicles fitted with stock block motor up to 5 litres / 302 cui which ran from 1967 in the USA 1969 in Europe and 1970 in the Antipodes coming to a stop in 1975 in the Antipodes and 1976 in the US and Europe. 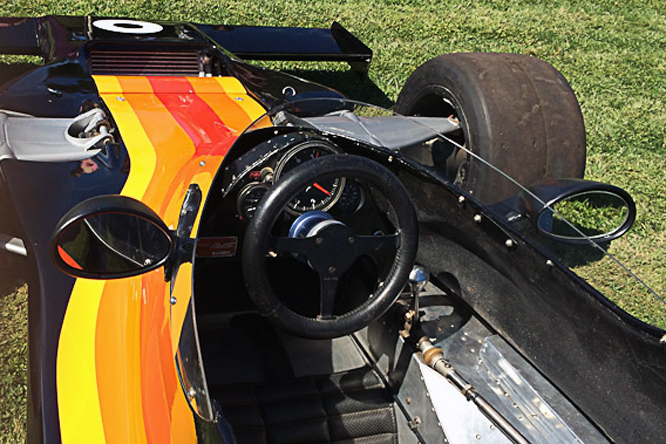 With the fall in competitiveness of the McLaren Can Am and Formula 5000 programmes, in 1972, McLaren Cars focused it’s attention on it’s Formula One and USAC Champ car programmes with the McLaren M23 and McLaren M16 respectively. 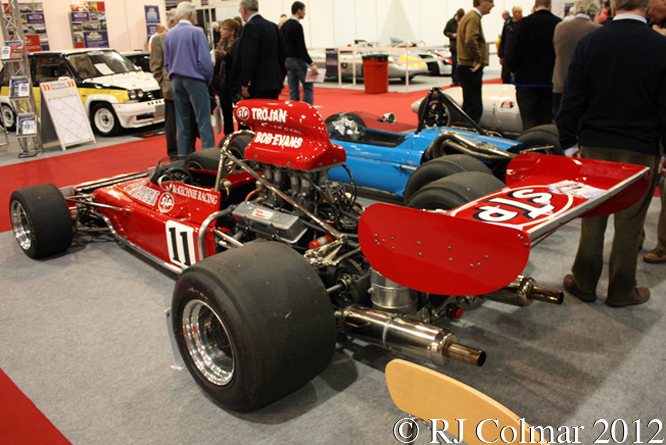 This left Trojan in a difficult spot since their business had been increasingly built on manufacturing McLaren Can Am and Formula 5000 open wheel cars under licence since the demise of their own Elva branded operations in 1964. 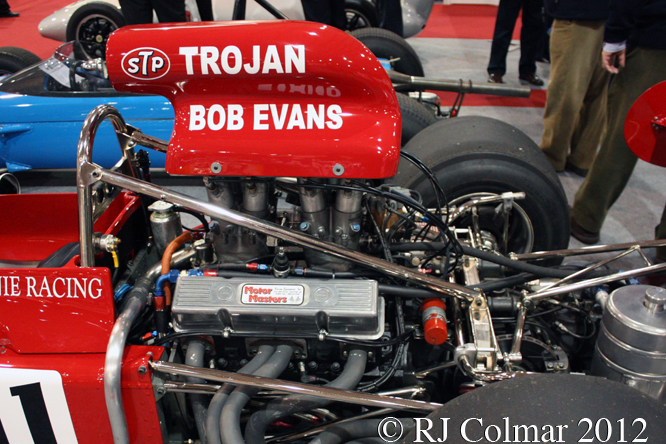 A compromise to keep Trojan going was reached which saw Trojan fuse an open wheel Formula 2 McLaren M21 chassis with a strengthened rear bulkhead to the rear end from the 1972 McLaren M18/M22 Formula 5000 car with a ubiquitous Chevrolet small block for power. McLaren Cars would not countenance the use of their name with the new car so it was called the Trojan T101. 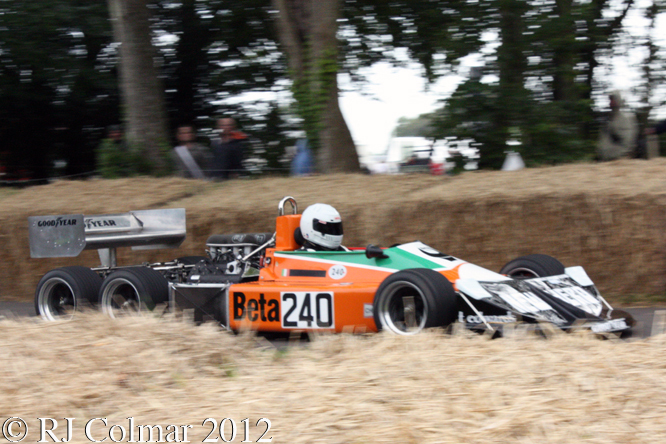 Former Brabham designer Ron Tauranac was brought in to help develop the model once it was built. 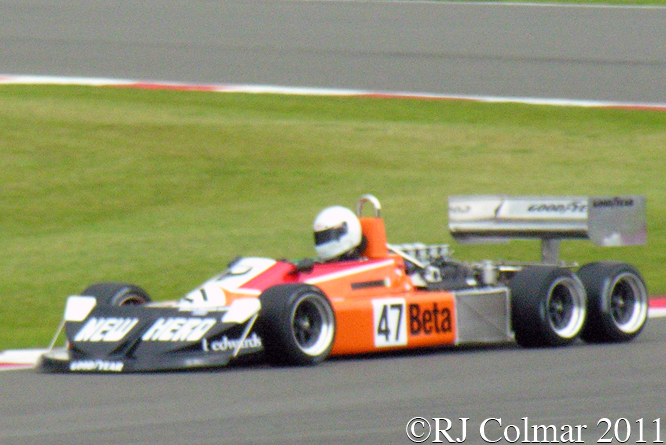 In all six T101’s were built and of the first five built for the 1973 season, the first four were driven to race victories in the UK and USA by the likes of Keith Holland, Brett Lunger, Jody Scheckter and Bob Evans. 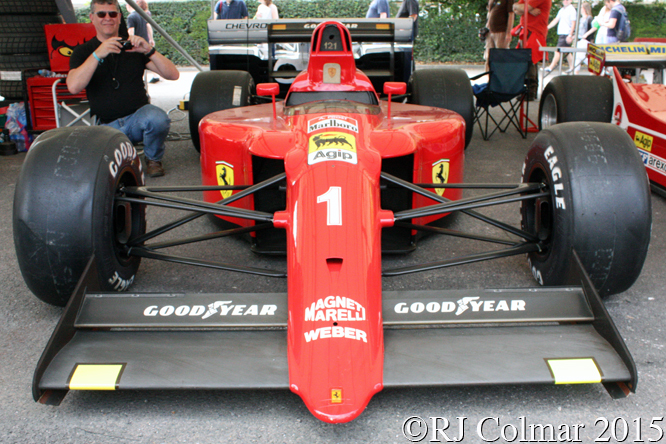 Scheckter won four races in the USA on his way to becoming L&M Champion in the SCCA Series. Today’s featured car #T101-102 was sold new to Sid Taylor, for Brett Lunger, Brett won on his debut in the car at Snetterton and set an all time 124 mph outright lap record, on the old long circuit in the 4th round of the Rothmans European Formula 5000 championship. Brett also won the 10th round at Mallory Park. Vern Schuppan raced #T101-102 in the opening four races of 1974 and thereafter it was driven by a variety of drivers of increasing obscurity in events of equally increasing obscurity in to the 1980’s which included, Leen Verhoeven, Damien Magee, Jim Kelly, Robin Hamilton, Jon Bradburn and Anthony Taylor in 1982. Simon Hadfield acquired the remains of #T101-102 in 2006 and has restored it, as seen here at last years Race Retro, with the livery and #11 originally seen on Alan McKechnie’s T101-104 raced by Bob Evans to victory at the second Snetterton round of the 1973 Rothmans European Formula 5000 championship. Thanks for joining me on this “Going It Alone Again” edition of “Gettin’ a li’l psycho on tyres” I hope you will join me again tomorrow. 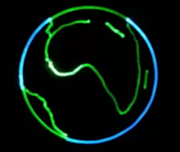 Don’t forget to come back now. 18/12/13 My original post inadvertently incorrectly implied that Trojan #T101-102 was jointly entered by Sid Taylor and Jerry Entin for Brett Lunger, in fact Brett’s car was solely entered by Sid Taylor, however Sid and Jerry did jointly enter the Trojan #T101-103 driven by Jody Scheckter in the 1973 L&M Series. Apologies for any confusion. 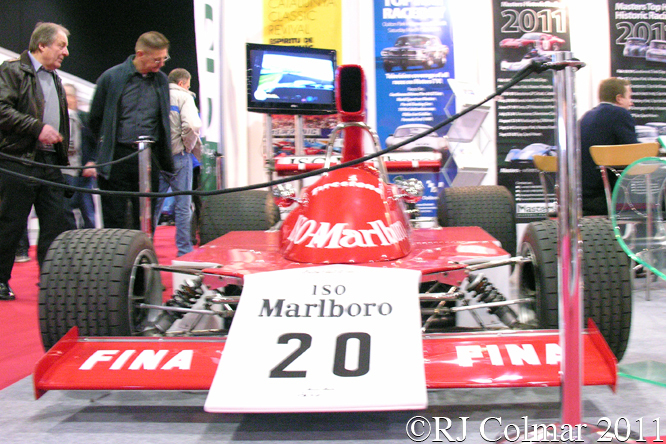 This entry was posted in Uncategorized and tagged Bradburn, Chevrolet, Evans, Formula 5000, GALPOT, Hadfield, Hamilton, Holland, Kelly, Lunger, Magee, McLaren, Race Retro, Racing Car, Ralph Colmar, Scheckter, Schuppan, T101, Tauranac, Taylor, Trojan, Verhoeven on December 7, 2013 by Ralph. 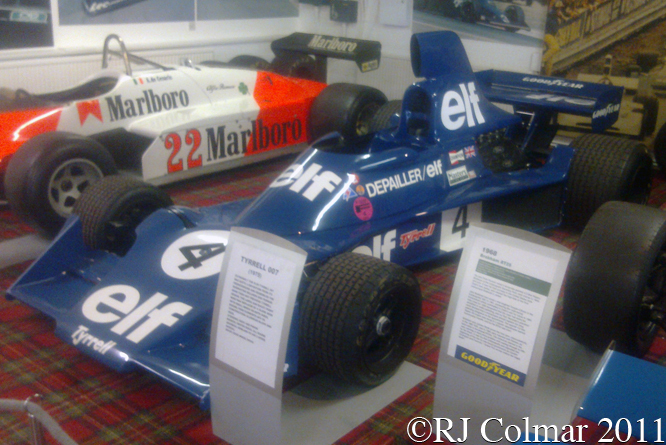 The 1973 Formula One season is remembered for many things some good Jackie Stewart’s third and final world championship some bad the death’s of Jackie’s team mate Francois Cevert and Roger Williamson who had been selected to replace Jackie upon his retirement. 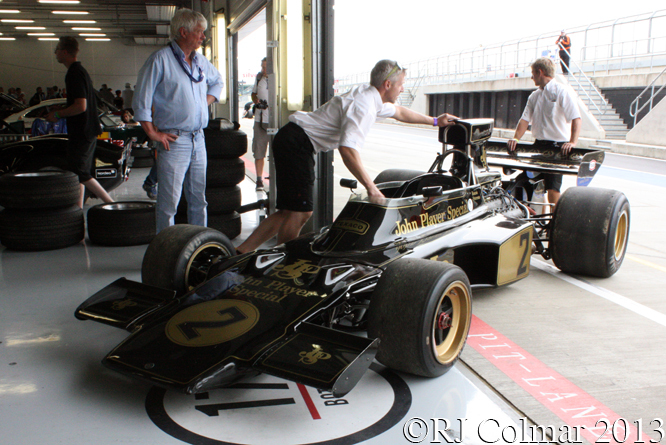 However one of my overwhelming memories of the season, the first which I avidly followed in the printed press which was as close to the internet as I could find back in the day, was the raw speed shown by Ronnie Peterson driving his Ford Cosworth DFV powered John Player Special sponsored Lotus 72. 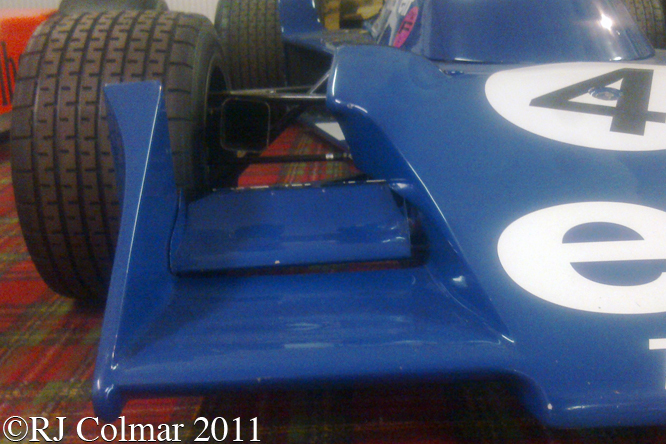 During the 1973 season Ronnie Peterson set a new record number of 9 pole position starts from the 15 race championship season as he finally found himself with a car capable of winning races rather than out lasting the opposition has the March cars he drove in 1971 to second place in the world championship standings had done. I believe seven of those pole positions and Ronnie’s four 1973 championship race victories were recorded in today’s featured chassis which I believe to be #R6. #R6 first appeared towards the end of the 1971 season in ‘D’ spec wearing the Gold Leaf Team Lotus colours with another Swede Reine Wisell at the wheel. Reine’s best result was a 4th place finish in the 1971 Austrian Grand Prix. For 1972 #R6 still in ‘D’ spec but now painted in the black and gold livery of John Player Special was driven by Australian Dave Walker. 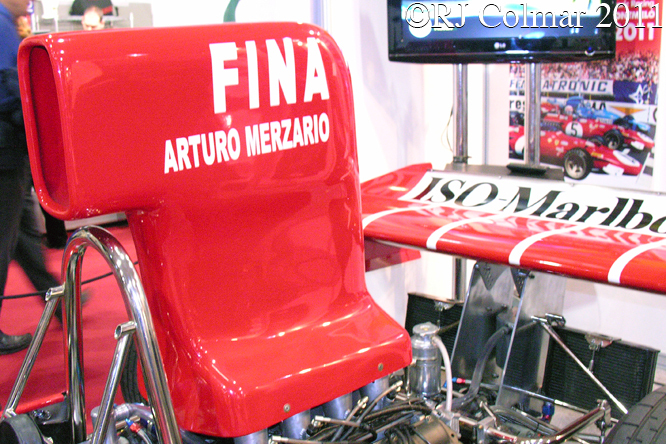 Dave who had built an enviable record in the junior ranks on his way up could not perform to the same level at the sports top table and only managed a best 5th place finish at the non championship Brazilian Grand Prix with today’s featured chassis. Reine Wisell was reunited with #R6 at the 1972 United States Grand Prix where he finished 10th. Over the winter of 1972/73 Ronnie Peterson joined Lotus from March and #R6 was brought up to 72 E spec which included wide track front suspension revisions which were soon abandoned and structural revisions to include a deformable structure around the side fuel tanks. By the time R6 appeared in ‘E’ spec at the non championship Race of Champions at Brands Hatch Ronnie had already scored his first pole for the Brazilian Grand Prix. At Brands Ronnie qualified 6th and fought his way into the lead by lap 5 an was running away from the field when his gearbox broke and forced his retirement on his 18th lap but not before he had set what would be a shared fastest lap time with the BRM drivers Jean Pierre Beltoise and Niki Lauda who had been Ronnie’s team mate at March in 1972. Ronnie drove to pole position for the following Spanish Grand Prix in chassis #R8 recording fastest lap before the gearbox failed. Back in #R6 Ronnie then won pole for the Belgian Grand Prix from which he retired after an accident. Ronnie was back in #R8 for the Monaco Grand Prix where he qualified 2nd and finished third behind Stewart and team mate Emerson Fittipaldi. Back in #R6 for the remainder of the 1973 season Ronnie was claimed his forth pole of the season in his home Grand Prix but finished second after leading his team mate for most of the race and in the process wearing out his tyres. 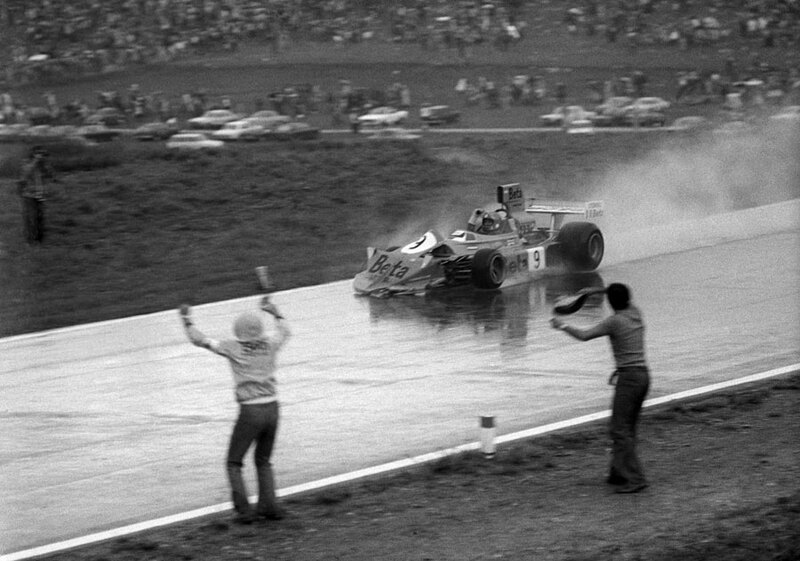 Emerson retired with gearbox failure four laps from home leaving Denny Hulme to pick up the pieces and sweep by to win the Swedish Grand Prix. At the 1973 French Grand Prix Ronnie finally took his maiden Grand Prix victory from 5th on the grid driving today’s featured car and two weeks later he claimed his fifth pole position of the season at the British Grand Prix, where he finished second. 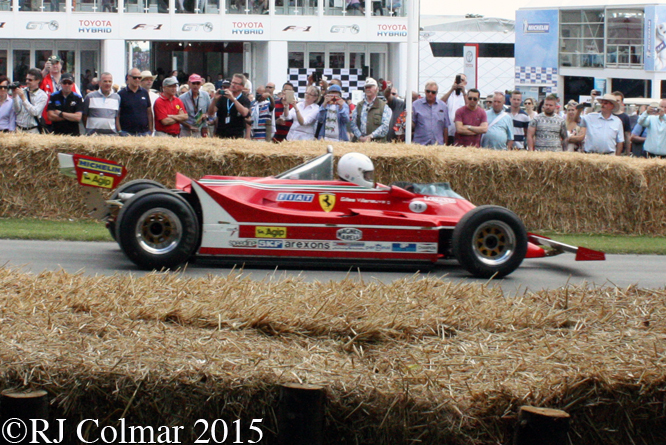 At the Dutch Grand Prix Ronnie was on pole in again but retired with gearbox and engine issues. In Germany Ronnie qualified 2nd but failed to finish. Ronnie won 3 of the final 4 championship races in 1973 in Austria Italy and the United States and pole for the final three races of the season in Italy, Canada and the USA. He retired from the Canadian Grand Prix with a puncture. Ronnie finished third in the 1973 World Drivers Championship behind Stewart and team mate Fittipaldi and there is no doubt that Emerson might have won the championship if he had not been forced to race his team mate as hard as he did. 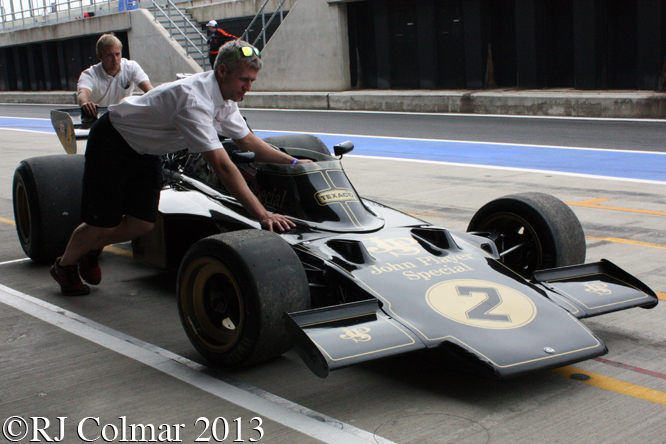 Lotus again won the constructors championship as they had with the same model in 1970 and ’72. 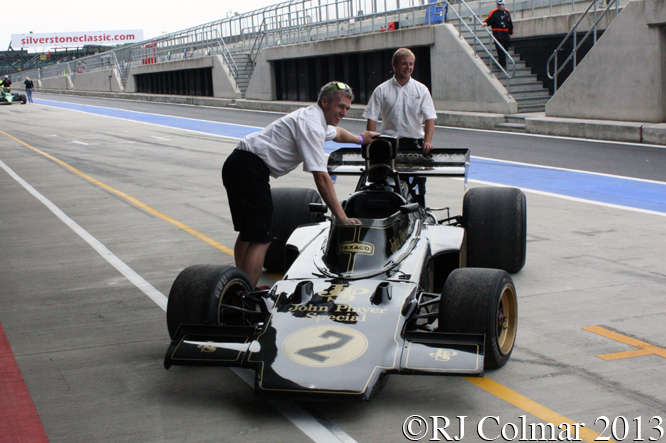 For 1974 Lotus had planned to replace the Lotus 72 with the Lotus 76, but when that failed to show potential the Lotus 72 design was pressed into service for the remainder of the season in slightly modified form with the oil tank moved from behind the gearbox to a position ahead of the rear wheels as mandated by new regulations. 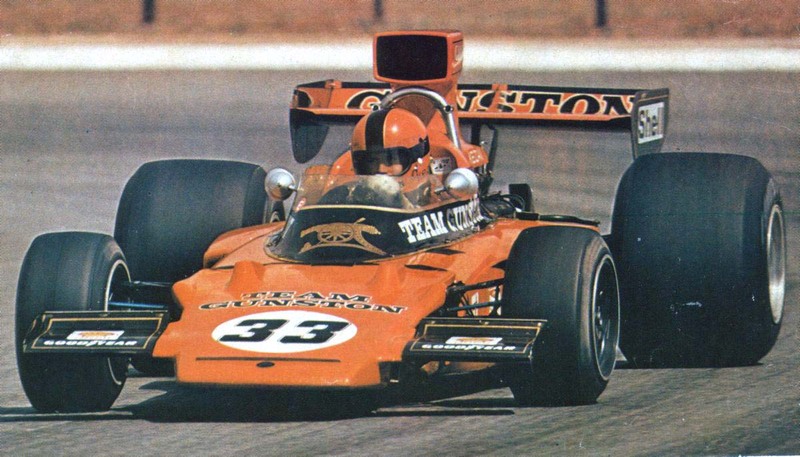 #R6 ended it’s in period competition career in South Africa where Team Gunston entered the car in the local Formula One series for Ian Scheckter, brother of Jody, in in 1974 Ian scored five wins in the South African series to finish second to Dave Carlton who drove a McLaren M23. 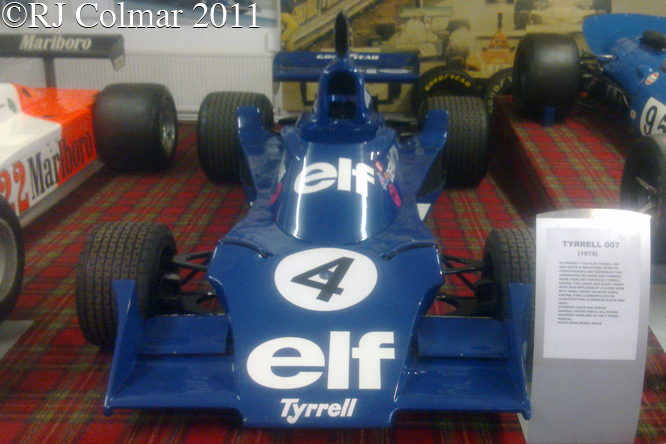 For 1975 Ian drove his brothers 1974 Tyrrell 007 and Team Gunston entered Eddie Keizan in #R6. 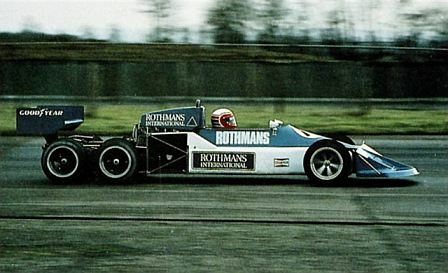 Eddie like Ian the year before in the same car finished 13th in the South African Grand Prix but could only manage a season high second in the local South African championship races after which it was retired. Ronnie Peterson fan Katsu Kubota is the current owner of #R6 seen here earlier this year at the Silverstone Classic meeting. Thanks for joining me on this “Peterson’s Poles” edition of “Gettin’ a li’l psycho on tyres” I hope you will join me again tomorrow. Don’t forget to come back now ! 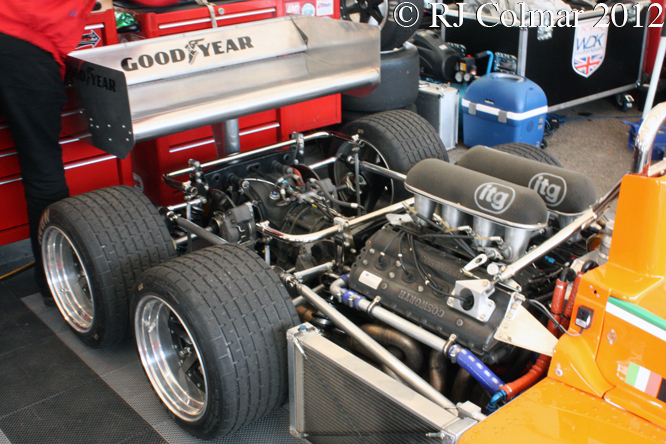 This entry was posted in Uncategorized and tagged 72E, Classic, Colmar, Cosworth, Formula One, GALPOT, Gold Leaf Team Lotus, John Player Special, Keizan, Kubota, Lotus, Peterson, R6, Race of Champions, Racing Car, Ralph, Scheckter, Silverstone, Team Gunston, Walker, Wisell on November 24, 2013 by Ralph. 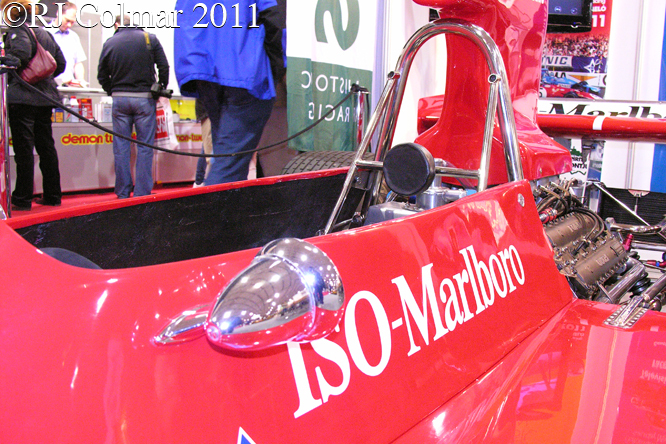 The story of March racing cars presence in Formula One was one of a meteoric rise in a blaze of publicity and a slow decline, the company founded in October 1969 had built six of the 22 cars that started the 1970 British Grand Prix, thanks to Ken Tyrrell who bought three March cars for 1970, after his split with Matra, a March driven by reigning Driver Champion Jackie Stewart started on pole position at the first race of the 1970 season and won the Spanish Grand Prix, the second race of the season. 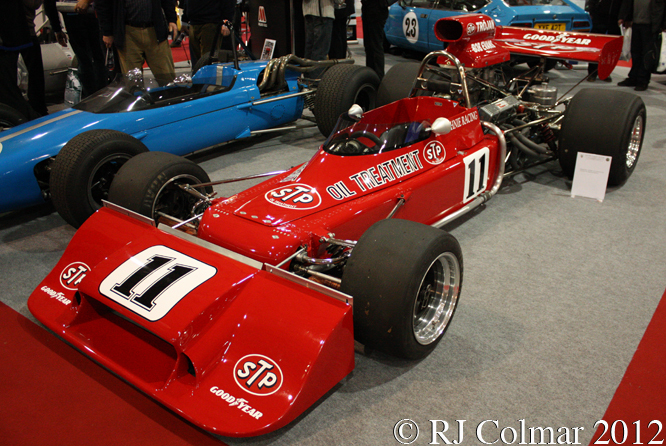 In 1971 Ronnie Peterson joined the works team and finished second in the drivers championship with no wins but 4 second place finishes. It was not until 1975 that the works March team won it’s first championship Grand Prix when Vittorio Brambilla crossed the line first at the prematurely concluded 1975 Austrian Grand Prix and promptly crashed into the crash barrier on the slowing down lap. 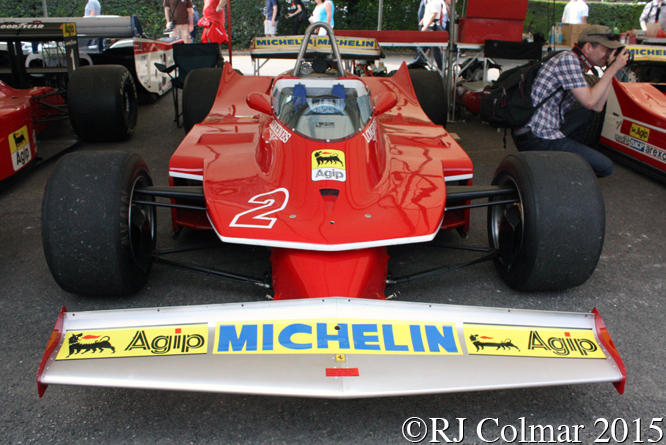 For 1976 Ronnie Peterson rejoined the March team and won the Italian Grand Prix which proved to be the team and manufacturers final championship Grand Prix victory. Looking forward to 1977 the team was short of cash when designer Robin Herd, who had designed the all wheel drive Cosworth in 1969 after he left McLaren, came up with the idea of building a six wheel car with four driven rear wheels as a way to improve on the mildly successful 6 wheel, 4 steering wheels at the front, Tyrrell P3/4. Team co-founder Max Moseley was instantly sold on the idea realising a six wheel March would be an excellent vehicle to generate some publicity and attract potential sponsors. 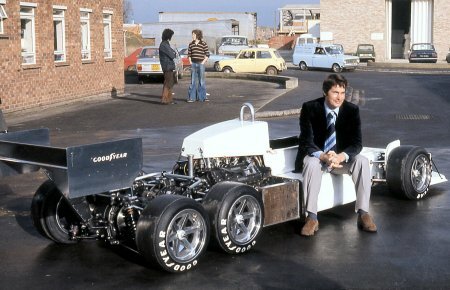 The shortage of cash meant the team focused on building the 4 wheel drive train and attendant suspension and attaching it to the back of a 1976 March 761, according to the best sources available to me this was chassis #761/1 which after several accidents was on it’s third monocoque tub and renumbered 761/10 for it’s press launch in early 1977 where a white prototype was shown. Turns out that only two of the rear wheels were driven at the press launch because not all of the internal components of the drive train had been finished in time to be installed. When all the parts were ready they were attached to the back of chassis #761/2 and Howden Ganley was employed to test the car with a strange mix of old body panels including a nose clearly marked Doug Sherison Racing that probably came from a March 76A Formula 5000 car. The concept did indeed attract a lot of attention and in March 1977 Rothmans held a press day at Silverstone at which they announced they would sponsor Ian Scheckter who tested the all wheel drive system now attached to a much older chassis, painted in Rothmans colours, that started life in 1974 as a March 741 #741/1 was renumbered to become #751/4 in 1975 and renumbered again to become #761/5 in 1976. 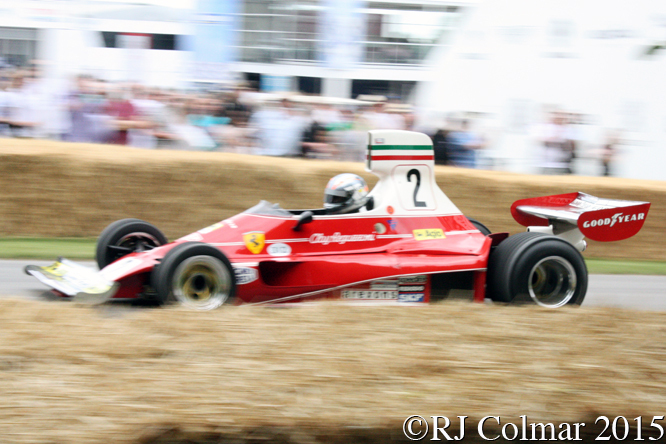 Regrettably after testing the concept the March team decided to revert to running a conventional 4 wheel 2 wheel drive layout for their 761’s which were updated to 761B spec for the start of the 1977 season. 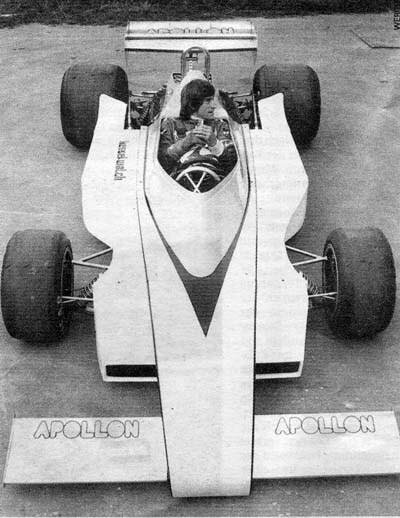 Around this time a well known picture began circulating of Alex Ribeiro sitting in his Hollywood sponsored car fitted with the 4 wheel drive transmission and a third set of rear wheels, as can be seen in this link young Brazilian F3 pilot Nelson Piquet can hardly keep a straight face in the prank photo. At the end of the season March folded it’s F1 operation, although it was continuing to make good money on the 2-4-0 from the Scalextric model rights and from a show car for which there was much demand. 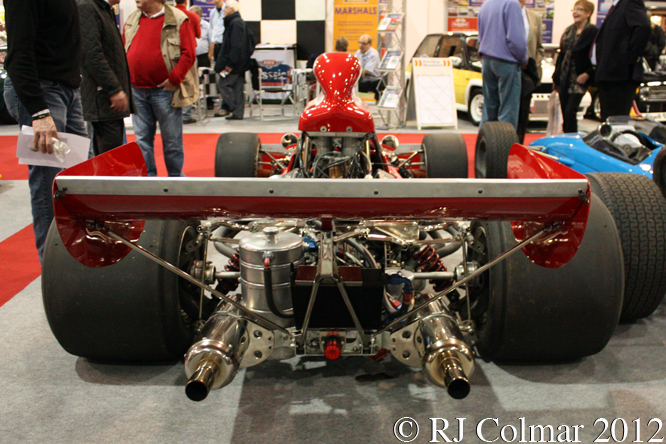 Despite the fact that the 6 wheel March 2-4-0 was never raced, so far as I know Robin Herd remains the only man to have designed two four wheel drive formula one cars neither of which raced, in period, a couple of years later Roy Lane managed to acquire the 4 wheel drive axles and fitted them to his March 771 which he used in the 1979 British Hillclimb Championship. 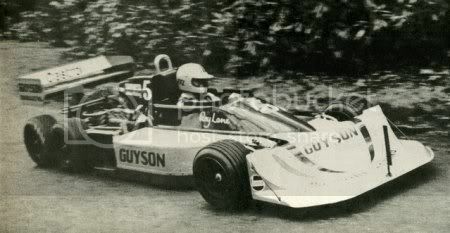 Roy won a round of the championship at Wiscombe Park but found that the advantages of the system in wet conditions were out weighed by the performance of the lighter 2 wheel drive in the dry and ended up converting his car back to a conventional layout during the course of the season in which he failed in his attempt to recapture the British Hillclimb Championship. The car featured today was built up by Anthony and Jeremy Smith with one of the two original 4 wheel drive transmissions built and a chassis who’s in period identity has not been established. Jeremy is seen at the wheel of the car at Silverstone top and Goodwood middle. By complete coincidence this March 2-4-0, there is another at the Louwman Museum, is currently for sale at Speedmaster Cars in Wetherby. My thanks to James Hanson at Speedmaster Cars who kindly answered my questions about the chassis of today’s featured car and to members of The Nostalgia Forum, not least Tony “Giraffe” Gallagher, who posted pieces of the March 2-4-0 jigsaw puzzle seen on this linked thread. Thanks for joining me on this “Showboating” edition of “Gettin’ a li’l psycho on tyres” I hope you will join me again tomorrow. Don’t forget to come back now ! PS Anyone planning on going to next weeks Silverstone Classic please remember this year will be advanced ticket only available on this link. 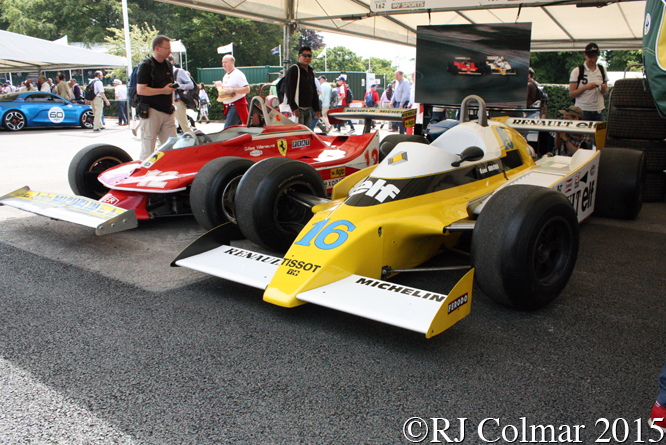 This entry was posted in Uncategorized and tagged 2-4-0, Cars, Classic, Colmar, Cosworth, Festival of Speed, Formula One, GALPOT, Ganley, Goodwood, Herd, Lane, March, Moseley, Ralph, Ribeiro, Scheckter, Silverstone, Speedmaster on July 21, 2013 by Ralph.